Giancarlo Stanton during intros before the Wild Card Game. @Yankees. The Yankees released their roster for the American League East Division Series on Friday afternoon. Lance Lynn - The Yankees acquired the big right-hander from Minnesota at the trade deadline. For the season, Lynn went 10-10 with a 4.77 ERA - 7-8 with a 5.10 ERA for Minnesota; with the Yankees, he went 2-3 with a 4.14 ERA (nearly a run less than with the Twins). Lynn started off well, but tailed off, but the playoffs is arguably why they got him, as he can serve many functions, like starting, being the long man out of the bullpen (think extra innings), or just there to get a big out at any moment. CC Sabathia - The veteran lefty, a key part of the Yankees' last championship in 2009, earned his spot on reputation more than anything. He went 9-7 with a 3.65 ERA, but there were plenty of tough nights throughout the season. He earned his spot for two reasons: his stellar performance in last year's playoffs and the fact that he is a fighter, as exhibited by the last pitch he threw in the regular season. Last Thursday, after Tampa Bay's Andrew Kittredge threw one at Austin Romine's head, Sabathia drilled Tampa Bay catcher Jesus Sucre and was promptly ejected from the game. 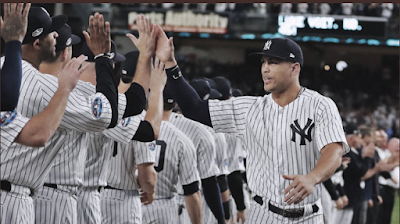 He cost himself a shot at a $500,000 innings incentive bonus, as he came too innings short of the number to trigger it, but he earned the admiration of his team, as if he didn't have it already. Stephen Tarpley - The 25-year-old rookie, a lefty reliever, impressed the Yankees enough to make the playoff roster. In 10 appearances, he had a 3.00 ERA, as he allowed 3 runs on 6 hits in 9 innings. He had a strong year in the minor leagues. At Double-A Trenton, he went 5-0 with a 1.26 ERA, threw 35-2/3 innings, allowed 7 runs (5 earned) on 18 hits and 15 walks, and racked up 33 strikeouts. At Triple-A Scranton-Wilkes Barre, he went 2-2 with a 2.65 ERA, as he threw 34 innings, allowing 10 runs (all earned) on 23 hits and 11 walks, with 38 strikeouts. Sonny Gray - The one-time ace of the Oakland A's whom the Yankees acquired at the 2017 trade deadline has been a shadow of his former self in New York. Gray was relegated to the bullpen after Lynn and J.A. Happ were acquired. 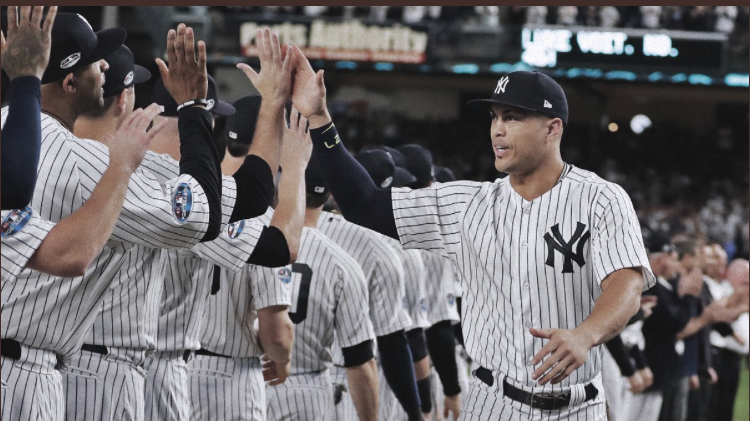 The Yankees lost faith in him after some brutal outings, including one against the Red Sox in early July in which he didn't get out of the second inning. For the season, Gray actually finished with a winning record of 11-9, but that 4.90 ERA tells the real story. Greg Bird - This one-time Baby Bomber, whom the Yankees hoped would form a new homegrown core like they had in the 1990s, lost his spot at first base to cult hero Luke Voit. Bird's injuries have cheated him of a chance to show his full potential, but his .199 batting average (54-272), along with 11 home runs and 38 RBI, tested the Yankees' patience, and once Voit (whom they acquired from St. Louis in July) burst on the scene, Bird saw his playing time greatly diminish.